Registration: 10:00 A.M. – 10:30 A.M.
Meeting: 10:30 A.M. – 2:00 P.M. This entry was posted in Quality, Quantity, River and tagged Alapaha River, Alapahoochee River, conservation, Georgia, Little River, New River, north Florida, quality, Quantity, river, south Georgia, Suwannee River, Suwannee Riverkeeper, Tift County, Tifton, watershed, Willacoochee River, Withlacoochee River, WWALS, WWALS Watershed Coalition on March 5, 2019 by jsq. 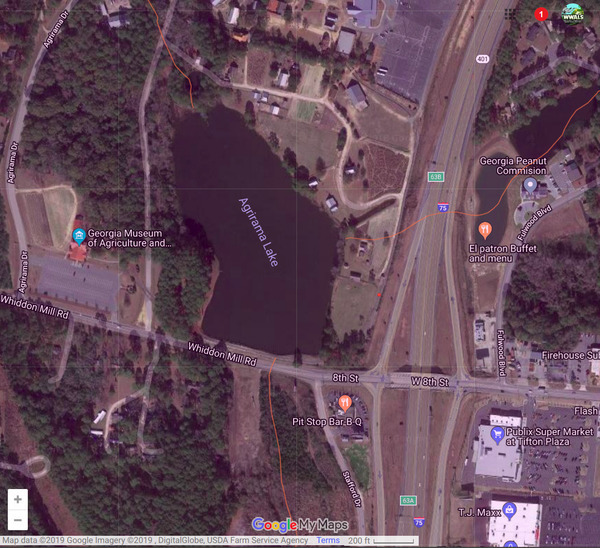 Yet again into Agrirama Lake, Tifton spilled 8,500 gallons of raw sewage yesterday (Sunday, January 6, 2019). And, finally, a number of gallons Valdosta spilled from its Withlacoochee Wastewater Treatment Plant back on December 15, 2018. As you can see, cities in the Atlanta Metro Area spilled more. And in the table below you can see many more of them spilled. This entry was posted in Quality, River, VWW and tagged Agrirama Lake, Atlanta, Clayton County, conservation, Dekalb County, Fulton County, Georgia, Little River, north Florida, quality, river, south Georgia, Suwannee Riverkeeper, Tift County, Tifton, VWW, watershed, Withlacoochee River, WWALS, WWALS Watershed Coalition on January 7, 2019 by jsq. 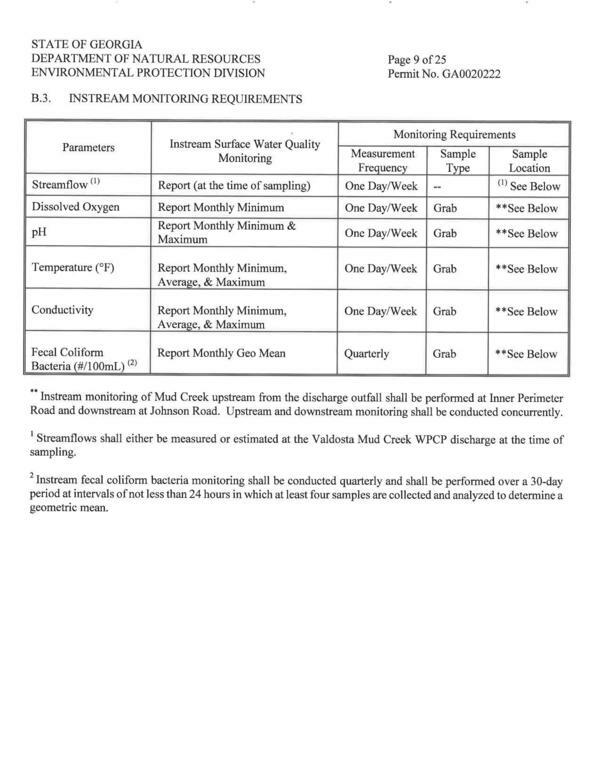 Schedules of testing, with permissable levels: these are in National Pollutant Discharge Elimination System (NPDES) wastewater permits, so we need to see those permits. You’d think they’d be on the EPA or GA-EPD website, but…. The U.S. EPA has delegated NPDES permitting to Georgia. You can get draft wastewater permits right off the GA-EPD website, but to get the actual current approved permits, you must get GA-EPD to send them to you. I found this out from Audra Dickson, Wastewater Regulatory Program Manager. I asked her for permits for half a dozen cities and one county, and the next day Alyssa Thomson, Environmental Specialist, Wastewater Regulatory Program, Municipal Permitting Unit, sent them via email. They’re on the WWALS website now. 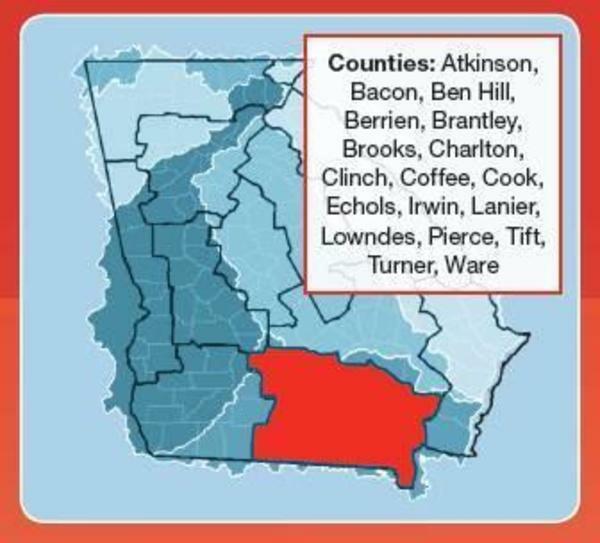 This entry was posted in creeks, Quality, River, VWW and tagged Adel, Alapaha River, Alapahoochee River, Alyssa Thomson, Audra Dickson, Bear Creek, Brooks County, Colquitt County, conservation, Cook County, creeks, Franks Creek, Hahira, Indian Creek, Knights Creek, levels, Little River, Lowndes County, Moultrie, Mud Creek, New River, north Florida, quality, Quitman, river, south Georgia, Spence Field, Suwannee River, Suwannee Riverkeeper, testing, Tift County, Tifton, Valdosta, VWW, watershed, Withlacoochee River, WWALS, WWALS Watershed Coalition on August 31, 2018 by jsq. 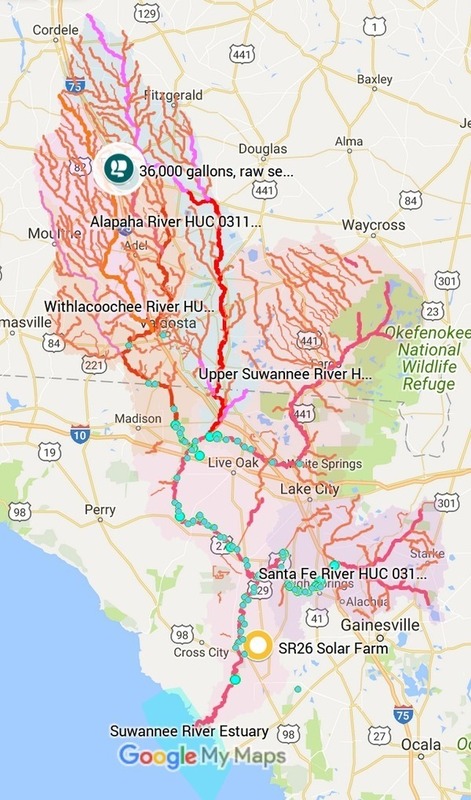 Tifton spilled twice into the New River watershed, 36,000 gallons and 5,400 gallons, both into the New River watershed upstream of the Withlacoochee and the Suwannee Rivers, apparently both spills during or after Tropical Storm Alberto, and there was no public notice until two weeks later. 36,000 gallons, Wednesday, May 30 through Thursday, June 7, 2018, from 315 E. 20th Street, into Tifton’s stormwater system, after 2 inches of rain. This entry was posted in Quality, River and tagged conservation, Georgia, Little River, New River, north Florida, quality, river, sewage, south Georgia, Suwannee River, Suwannee Riverkeeper, Thomas Coker, Tift County, Tifton, Water Reporter, watershed, Withlacoochee River, WWALS, WWALS Watershed Coalition on June 14, 2018 by jsq. Update 2018-07-05: All the winners. Update 2018-07-16: All the paddlers. 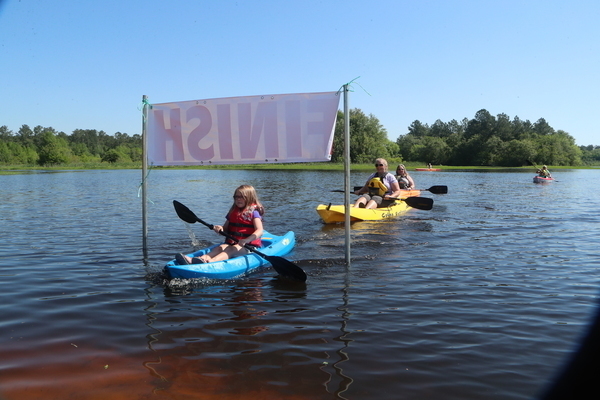 Hahira, GA, April 29, 2018 — With the first-ever winner from Florida and a new record time, the next two categories one each from Tift and Lowndes Counties, Georgia, and a record number paddlers from 4 to 67 years old, the BIG Little River Paddle Race at Reed Bingham State Park Saturday was a fun time and a successful fundraiser for Friends of Reed Bingham State Park (FORB) and WWALS Watershed Coalition (WWALS). Lloyd Reeves drove three hours from Crescent City, Florida, with a very fast kayak, to become the first-ever Florida winner, and he proved himself a winner in another way with the prize. This entry was posted in BLRPR18, Blueway, Outing, River and tagged BLRPR18, Blueway, Bret Wagenhorst, conservation, Crescent City, Florida, FORB, Friends of Reed Bingham, Friends of Reed Bingham State Park, Georgia, Hahira, Little River, Lowndes County, north Florida, Outing, paddle, Putnam County, race, Reed Bingham State Park, river, south Georgia, Suwannee Riverkeeper, Tift County, Tifton, watershed, Withlacoochee and Little River Water Trail, WWALS, WWALS and FORB, WWALS Watershed Coalition on April 29, 2018 by jsq. 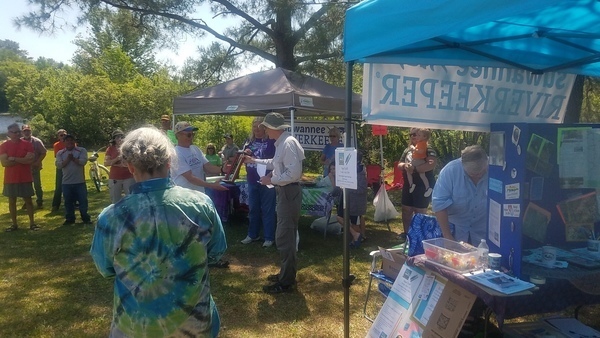 Hahira, Georgia, December 13, 2017 — People got kayak raffle tickets for three months at festivals from Alapaha, Georgia to Live Oak, Florida, and online, until the drawing at a Suwannee Riverkeeper outing Sunday at the top of the Suwannee River in the Okefenokee Swamp. The lucky winner of a kayak donated by Malibu Kayaks is Chris Newton from the Atlantic coast of Florida. “No way!” he said. This entry was posted in Outing, PR, Raffle and tagged Alapaha, Atkinson County, Berrien County, Brooks County, Chris Newton, conservation, Dan Phillips, Dave Hetzel, Dennis Price, Dixie County, Eileen Box, Gretchen Quarterman, Hahira, Hulaween, John Horton, John Phillip Ramsey, John S. Quarterman, Live Oak, Lowndes County, Malibu Kayaks, Minnie Lake, north Florida, Okefenokee Swamp, Okefenokee Wilderness Area Canoe Trails, Outing, Pearson, Phil Hubbard, Quitman, river, Sara Squires, Scotti Jay, Shirley Kokidko, south Georgia, SRWT, Suwannee, Suwannee County, Suwannee River, Suwannee River Wilderness Trail, Suwannee Riverkeeper, Tift County, Tifton, watershed, WWALS, WWALS Watershed Coalition on December 13, 2017 by jsq.